Police officers are looking to fry up the two turkeys who wiped out in a stunningly stupid Thanksgiving Day Corvette drag race. One turkey is apparently a mama's boy and the other is possibly a known scammer. 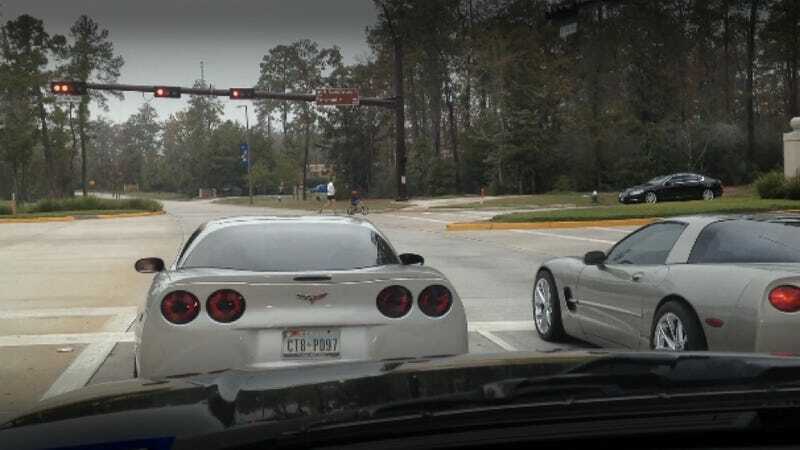 The now infamous accident occurred on Thanksgiving Day as the result of an inept drag race between a silver C5 and silver C6 Corvette on busy public streets. Because it happened in the small suburb of The Woodlands, news of the video got around fast. As a former resident of the wooded 'burb visiting my family over the holiday, I heard about it from multiple friends, so I assumed that the police also probably got the message. Turns out they did, at least according to a person on the LS1GTO forum claiming to be the first patrolman on the scene. They both tried to tell me they weren't racing. The C5 claimed to be pushing 600rwhp... He claimed he dumped the clutch and thats why he lost control. Lol. Well, the driver on the left was 23 and called his parents immediately. As soon as we placed him in cuffs his mom started screaming to go to the hospital. So we sent him to the hospital and decided to cut the other guy loose due to the kid not going to jail. Warrants are being issued for both of their arrests now. We recieved [sic] a 911 call (from a witness) saying that a major accident just accused and the other corvette was attempting to leave the scene. And the other vette wasn't drivable. Due to it being a major accident, we have to investigate. So there's probable turkey number one, being bailed out by his mom. Despite being completely irresponsible and likely getting arrested, I just have this bad feeling (from experience) he may get his C5 back. And what of the other guy? According to LS1TECH (and always take Internet justice with a grain of salt), the C6 driver is Brian Hebert, a parts scammer of ill repute. Now the users over there are enjoying what they view as karma. Allow me to repeat my conclusion from the last post: it's good to be home.